WORDSONGS -3, Recovery is the third album in The Wordsongs Series. The pains of life do not spare any of us. We all struggle and look for something to ease the pain. This book follows the dreams of a lonely man who used drugs and alcohol to cope with the pain in his life. Observe his broken dreams and struggles on side one and his re-awakening to a new life in recovery on side two. 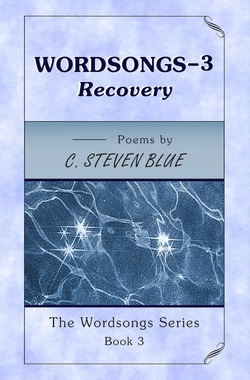 In this inspirational and innovative book, C. Steven Blue presents another great set of heartfelt wordsongs. Each book in this series contains 20 pieces designed to be similar in scope to a music record album, with side one and side two, but instead of songs it is comprised of a style of poems that are called wordsongs. Each book is a concept album, with a general theme running through it, told in verse format. If you purchase WORDSONGS -3, Recovery here, it can be signed by the author. S.O.S. ~ Songs Of Sobriety ~ A Personal Journey Of Recovery. That book took over 20 years to write and covers the first 10 years in the recovery process.